Decorative map of the Iberian Peninsula. A New and Accurate Map of Spain and Portugal. 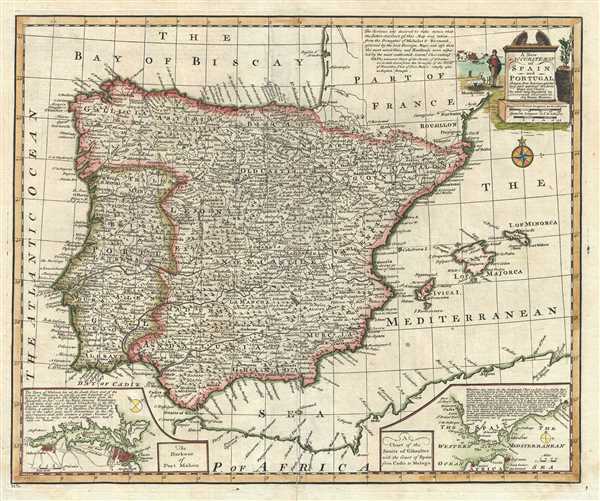 This is a charming map of Spain and Portugal by the English cartographer Emanuel Bowen. It depicts the Iberian Peninsula including the islands of Majorca, Minorca and Ibiza. The map renders the entire region in extraordinary detail, noting mountains, rivers, roads, lakes, cities and other topographical features. Two insets are included in the bottom left and right quadrants respectively. The first features the Harbor of Port Mahon and the other details the Strait of Gibraltar with the coast of Spain from Cadiz to Malago. It notes the provinces, as they appeared when the map was drawn, with New Castile and Old Castile being the most prominent at the center of the map. A former kingdom, this area eventually merged with its neighbors, and today comprises the autonomous regions of Castile y Leon in the northwest, and Castile-La Mancha and Madrid in the center and south of the country. Many of the provinces appear in their modern configuration. A decorative title cartouche adorns the top right quadrant. This map was prepared by Emanuel Bowen as plate no. 11 for the 1747 issue of A Complete System of Geography. Very good. Minor wear and verso repair along original centerfold. Minor spotting.